From Sheryl Sandberg and the Nasdaq to the graffiti artist who took stock instead of cash, here's who's riding high and lying low one year after the Facebook IPO. After an incredible amount of hype, Facebook's stock disappointed from day one. Shares hit an intraday high of $45 on May 18, 2012 but closed at $38.23. And they kept falling. 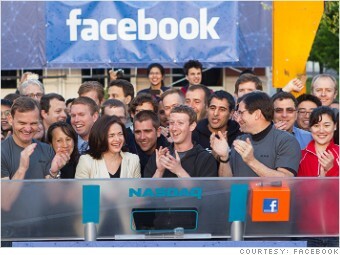 The fizzle disappointed investors who were hoping Facebook (FB) would be a strong performer like LinkedIn (LNKD). Some attributed the first-day disappointment to confusion over Nasdaq's technical problems (see next slide). But concern about Facebook's late entrance into the mobile ad market was the main reason the stock never recovered. On September 4, Facebook closed at an all-time low of $17.73. A week later, Facebook CEO and founder Mark Zuckerberg acknowledged publicly that the stock performance was "disappointing." But he insisted that Facebook was working on its mobile problem. That new focus on mobile has helped boost Facebook's revenue, and the stock has pulled away from the doldrums. Shares began creeping off their lows in late 2012, though they're still 30% below the IPO price.